What is Full Truckload Shipping (FTL)? Simply put, FTL refers to a full truckload of freight. A full truckload can refer to two things: you may have enough products to fill an entire full truckload, or you prefer a dedicated truck to handle your partial load. If you have ten pallets or more to ship, if you have a high risk shipment, or if time is an issue, you will want to consider full truckload shipping. Keep reading to find out all about FTL shipping and why it’s a good option for your next shipment! AFP Global Logistics offers economy service, direct-drive for more urgent shipments, and partial load shipping when your shipment has too many pallets for LTL and not enough for a FTL. FTL will get your shipment delivered much faster than LTL. It is the best way to transport your large shipment. 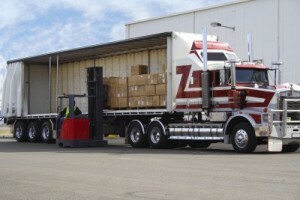 Your shipment will remain in the same truck during the entire shipping process. FTL is ideal for any high risk or delicate freight shipments. AFP Global Logistics offers economy service, direct-drive for more urgent shipments, and partial load shipping when your shipment has too many pallets for LTL and not enough for a FTL. Partial load shipping is more economical and is handled less frequently than LTL freight. AFP has a large network of trucking companies all over the country with service to all shipping lanes, specializing in every aspect of the business: flatbed, step deck, refrigerated, and more! This entry was posted on Wednesday, September 16th, 2015	at 10:32 am	and is filed under News, Shipping Methods	. You can follow any responses to this entry through the RSS 2.0	feed. Both comments and pings are currently closed.